Meets Sundays at 11:30 a.m.
Wednesday Night Bible Study at 7:30 p.m.
One of the two daughter churches at FBC Galt is the Living Hope Bible Church. The church, which primarily serves the Filipino community, meets at FBC Galt each Sunday at 11:30 AM. The Living Hope Bible Church was begun a number of years ago by Pastor Herbert Espera who now splits his time between the United States and the Philippines. Pastor Herbert remains an active member of the church whenever he is in the United States. Meeting of the "Living Hope Bible Church"
Pastor Henry Bermudo, who shepherds the Living Hope Bible Church in Galt, knows something about God's power to change people's hearts. Henry immigrated to the United States from the Philippines in 1967 as a 19 year-old student. He believed in himself and his ability to earn money and advance himself. In every way Pastor Henry fulfilled the closing lines of William Ernest Henley's famous poem, "Invictus". In 1975 Pastor Henry was involved in a weekly bowling league. One of his friends who was on the team began sharing God's love with Henry. Henry welcomed the opportunity to debate his world view. Every time his friend would talk about God's power, Henry countered with an argument that he felt was convincing. Again and again he would tell his friend, "You rely on the same thing as I do, the 'power of the paycheck'." He would tell his friend that they could not provide for themselves if it were not for the "power of the paycheck." His friend countered that everything is actually from God. Henry scoffed at this, but still enjoyed the weekly conversations. The friend was "consistent and insistent" according to Pastor Henry, and over the course of six months, Henry ran out of arguments. One morning in 1975 the two friends were having breakfast together. The breakfast consisted of ham, eggs and hash browns, a detail which Pastor Henry remembers to this day, almost 30 years later. After his friend prayed for the meal Henry, then 27, began sobbing. Without any specific prompting from his friend, he gave his life to God that morning. In a modern day fulfillment of the parable of the persistent friend (Luke 11:5-10), his friend was rewarded that morning when Henry yielded the command of his soul to God. In 1975 Henry suffered from a number of psychosomatic illnesses. He had a large quantity of medicines, and he supplemented these medicines with frequent use of alcohol. Almost immediately after giving his heart to God, Henry knew he no longer needed these medications. One day, shortly following that fateful morning breakfast, Henry gathered up all the medications (along with all his "worldly" books), put them in a plastic bag, and threw them away. In the following months, the bowling alley became a place of regular fellowship with his friend. Over time the two friends planned to go into ministry together, but his friend subsequently decided to return to the Philippines, and nothing came of their plans. It was in 1994 when Henry heard a radio sermon by Charles Stanley on Christians being in the Lord's army. Henry felt a strong tugging that God was telling him that he was not in the battle, but lingering behind the lines. He was sure that God was calling him to preach, and he immediately yielded to this call. Over the past ten years, Pastor Henry has been involved in six churches, which have been primarily "house churches," gatherings in homes rather than church buildings. Pastor Henry encourages "Quality Believers"
Pastor Henry's vision for the Living Hope Bible Church, as well as that of all of his ministry opportunities, is to develop "quality believers". "I'm not interested in the quantity of people who attend our services, I'm interested in the number who will seriously pick up their cross and follow the Lord," says Pastor Henry. 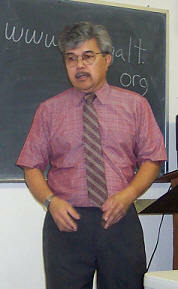 Pastor Henry hopes one day to return to the Philippines to open a missionary school. In the meantime, he is involved in starting a "foot ministry" of going out into the cities and simply talking to people on the street, telling them about the love of God. In early 2004, Pastor Henry lost his job when the company he was working for downsized. Instead of immediately trying to find another job, he decided to trust the Lord for his provision so that he could devote more time to ministry. "It's tough sometimes, but the Lord has met all of our needs, many times at the last minute. But, He always comes through." What a difference from the man who at one time put all his hope and trust in the "power of the paycheck." Pastor Henry lives in Sacramento, California with his wife of 27 years, Carmelita and their two sons; Ariben (26) and Joseph (22).